Students request for evening bus and shuttle services, to ensure their safety. NIGHT BUSES: Wits students who live at home have called for bus services to taxi ranks to ensure their safety, especially when leaving campus late at night . WITS students feel that their safety is threatened when leaving campus late at night and a Wits bus service to taxi ranks and private residences would be a great help. 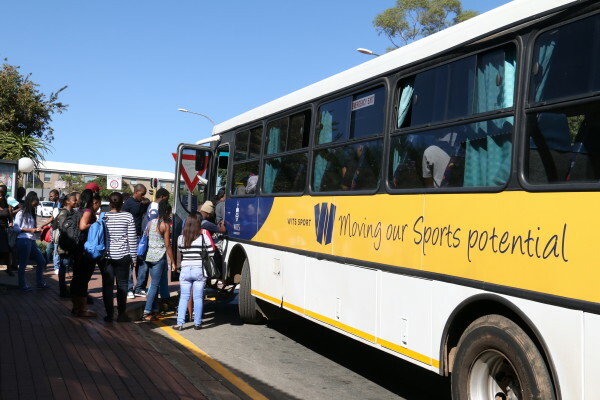 Wits bus services support students living at Wits residences and operate throughout the day but offers no services to areas just outside the campus. Nelson Mandela Bridge, connecting Braamfontein to Bree Street taxi rank, has been a hot spot for crimes and muggings. Last week Wits Vuvuzela reported that 35 people were arrested near the bridge with many found with stolen student cards. Johannesburg Metro Police Department spokesperson Wayne Minnaar said students are soft targets because they are young and vulnerable. Keabetswe Modisakeng, a first-year Accounting Science student who lives in Soweto, said that to get home she has to take a taxi before Mandela Bridge to Bree Street taxi rank for safety. “I don’t feel safe after Mandela Bridge,” she said. She said a bus service operating from 5pm to 8pm from Wits to Bree Street would be helpful. SRC vice president Motheo Brodie said that the SRC has been talking with the authorities about a bus service that goes to Bree Street. Brodie said research into bus services was at very early stages. “We are doing our research, moving towards the proposal,” Brodie said. He continued that surveys will be carried out to get statistics that support the need for a bus service. He said if necessary, the bus service would stretch to the taxi ranks on Bree Street, Noord Street and Park Station. “Students that travel from home via the taxi ranks have been neglected for a long time by the university and the university needs to cater for these students given the muggings and threat to safety that students face on a daily basis,” Brodie said.